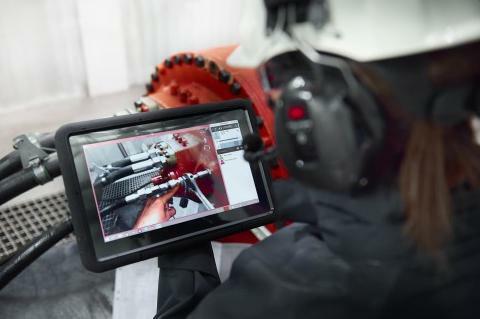 With Hägglunds InSight Live, Bosch Rexroth provides plant operators with a solution that enables remote support for their in-house maintenance teams anywhere in the world. The Hägglunds Insight tool facilitates instant support through the use of virtual reality. With nothing but a rudimentary internet connection and a smartphone, tablet or laptop, customers get direct support from Rexroth product and application experts. The Insight Live platform is designed to work with limited bandwidth and mobile connectivity and can provide a powerful virtual reality real time support. The customers’ engineers can contact the Bosch Rexroth service team and start the app when they require on-site support. The app establishes immediately a sound / image connection to the correct product or application specialist. With the appropriate type of service agreement, the specialists are available for all service queries regarding Hägglunds heavy-duty drives. The specialists see everything the customer’s engineer sees and in return, by way of the intelligent platform, they can also superimpose their hands, tools, documents and diagrams on top of the image the customer engineer is displaying. This way the experts can show where the engineer can find the needed information and guide him through diagnosis and solution. Especially in remote areas, for example in raw materials extraction, diagnosis and the correct service actions can be performed very quickly thus reducing maintenance costs for the customer. Hägglunds Insight Live is a service tool specifically designed to drive down the customers’ risks and cost of ownership.